One way of gauging wildfire activity is to look at how many days the federal government was operating under various preparedness levels. The National Interagency Fire Center uses five categories, similar to the now-abandoned Homeland Security threat levels. Preparedness level 5 is reserved for the most active times, while under level 4 the competition for firefighting resources is a bit less intense, and so on down to level 1. 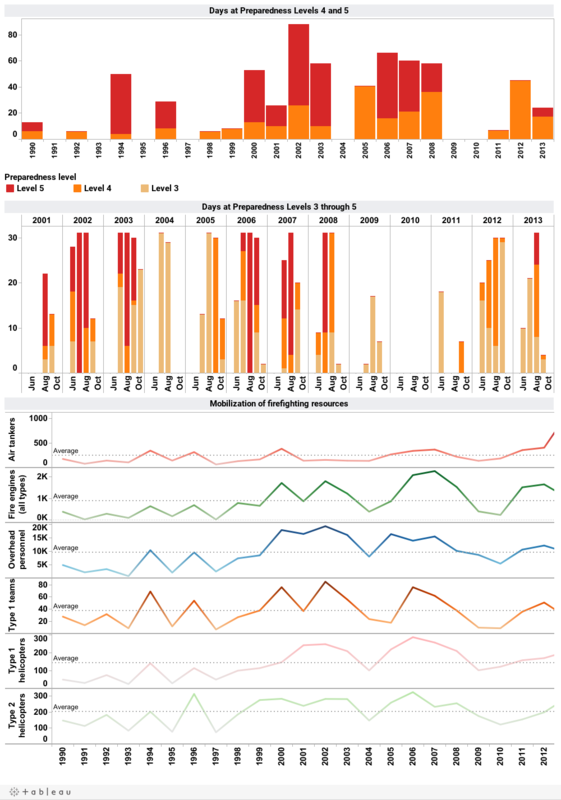 The federal government also closely monitors how it deploys its firefighting resources each year, and this dashboard summarizes those barometers. Type 1 helicopters are larger than type 2 helicopters, and type 1 mobilizations refers to the number of times that top-level incident command teams are deployed. Learn more about the issue by checking out our wildfire page and PowerPoint deck.